“ForeclosureFriendlies.com,” an Amazon #1 New Release, will be free and available for download on Amazon from 2/11/19-2/15/19. The book details a foreclosure strategy that provides hope for homeowners and profit to investors. Attorney Rick Rogers developed and uses this strategy to help families save their homes from foreclosure. His desire for publishing this book is that homeowners and investors will have the tools to find one another and the resources to achieve maximum mutual benefit. Over the last 10 years, The Rogers Law Group has helped more than 2,000 families in the Chicago area keep their homes after a financial crisis. This book publicizes a strategy Rick personally developed and uses successfully to help homeowners save their homes after all conventional methods have failed. Rick Rogers, JD/MBA is proud to launch his new book “ForeclosureFriendlies.com: How Families Can Save Their Homes from Foreclosure and How Investors Can Profit by Helping,” an Amazon #1 New Release. Rick Rogers wrote “ForeclosureFriendlies.com” to homeowners in foreclosure and foreclosure investors. The book describes what Rick calls a “Friendly Foreclosure” whereby the homeowner and investor team up before the auction. This strategy presents one last opportunity for qualified homeowners to save their homes under attractive terms after conventional methods have failed. Additionally, the strategy eliminates ugly aspects of foreclosure investing and provides exceptional returns for investors. The companion website, www.foreclosurefriendlies.com, is designed after Match.com to match homeowners and investors. 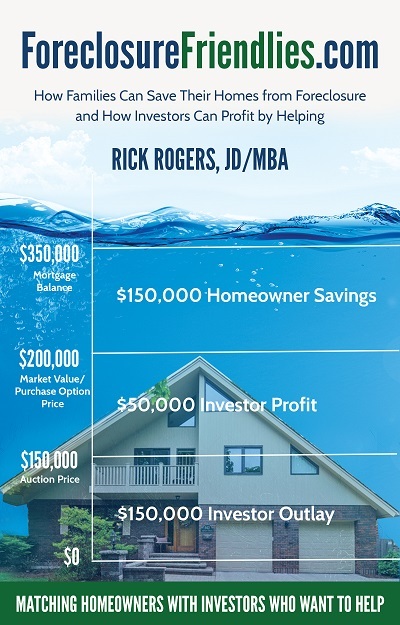 Rick’s hope is that publishing this book will bring awareness to this little-known strategy and give homeowners and investors across the country the tools to find one another for maximum mutual benefits. “ForeclosureFriendlies taps into a hidden resource that is a win-win for both the distressed homeowner and the investor. Rick Rogers delivers the steps in an easy to understand fashion and the addition of the web site supports the transition to taking action.” – Lynn Z.
Rick Rogers is a managing real estate broker, managing attorney of The Rogers Law Group, a private real estate investor and Illinois native. He has spent nearly his entire career in real estate and has completed thousands of transactions around the world. Over the last 10 years, his law firm has helped more than 2,000 families in the Chicago area keep their homes after a financial crisis. This book publicizes a strategy Rick personally developed and uses successfully to help homeowners save their homes after all conventional methods have failed.